It’s the only holiday to honor a number: Pi Day, on 3-14, the beginning digits of the infinite, non-repeating decimal expansion of pi = 3.1415926… This important number is the ratio of a circle’s circumference to its diameter, but pi is also irrational and transcendental — and humans have known about it for thousands of years. So, join the Jackson College Mathematics & Engineering Department in our celebration of an incredible number, symbol, and concept! 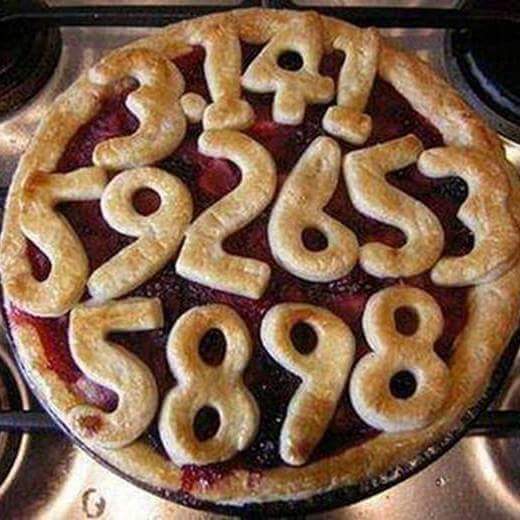 Picture: From The Self-Referential Cookbook: the first 13 digits of Pi (last displayed digit rounded). In 2019, sadly, Jackson College will be on Spring Break during the official Pi Day, but we’ve decided to host events in February to anticipate and celebrate the day! Four competitions — all of which offer terrific prizes to the winners! Pi-themed Trivia Competition – Jets Hangar, Central Campus, 8 p.m.
Come and learn, or compete to show what you already know, about the fabulous number, pi. This fun competition is open to all, and the showing of The Martian will immediately follow. Fabulous prizes for the winners, as well as free popcorn, lemonade, and (of course) pie for all! Screening of The Martian – Jets Hangar, Central Campus, 8:15 p.m.
Come check out this movie and learn about how mathematics plays an important role in this exciting human endeavor. Free popcorn, lemonade, and (of course) pie will be served! Here’s your first chance to win a prize! So, if you can find the problem, clearly identify the problem, and solve it with some creative ingenuity, you can win a prize! Submit your solution to our T-Shirt/Poster Puzzle Master, Professor Sara Main.